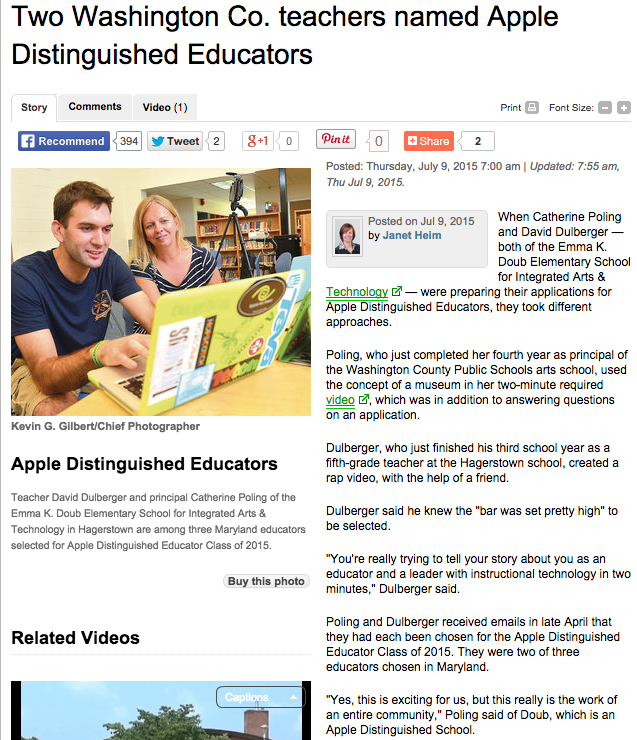 Apple Distinguished EducatorsTeacher David Dulberger and principal Catherine Poling of the Emma K. Doub Elementary School for Integrated Arts &amp; Technology in Hagerstown are among three Maryland educators selected for Apple Distinguished Educator Class of 2015. When Catherine Poling and David Dulberger — both of the Emma K. Doub Elementary School for Integrated Arts & Technology — were preparing their applications for Apple Distinguished Educators, they took different approaches. ﻿Poling, who just completed her fourth year as principal of the Washington County Public Schools arts school, used the concept of a museum in her two-minute required video, which was in addition to answering questions on an application. Dulberger, who just finished his third school year as a fifth-grade teacher at the Hagerstown school, created a rap video, with the help of a friend. Dulberger said he knew the "bar was set pretty high" to be selected. "You're really trying to tell your story about you as an educator and a leader with instructional technology in two minutes," Dulberger said. Poling and Dulberger received emails in late April that they had each been chosen for the Apple Distinguished Educator Class of 2015. They were two of three educators chosen in Maryland. "Yes, this is exciting for us, but this really is the work of an entire community," Poling said of Doub, which is an Apple Distinguished School. Every student at the school has an iPad, all the teachers have interactive Whiteboards, and there are computer labs with Windows computers and MacBook Airs, Dulberger said. The Apple Distinguished Educator Program began in 1994, when the computer company recognized pioneers in kindergarten through 12th grade and in higher education who were using a variety of Apple products to transform teaching and learning, according to the company. Poling and Dulberger join "a worldwide community of over 2,000 visionary educators and innovative leaders who are doing amazing things with Apple technology in and out of the classroom," the company said. They will attend the Apple Institute for Apple Distinguished Educators this summer with the goal of expanding their professional learning network and returning with fresh ideas for digital learning. Coincidentally, Poling was Dulberger's fifth-grade teacher at Myersville (Md.) Elementary School. She still remembers his creative website design for an assignment, as well as his leadership in the classroom, Poling said. Dulberger said fifth-grade was his favorite year of elementary school and that Poling did some "amazing stuff" with his class. They can't help but reflect on how technology has changed in the classroom since then, and both said they are grateful for students who are willing to keep trying new things. "None of this would be possible without the kids, and I told my students that when I was chosen," Dulberger said. To learn more about Apple Distinguished Educators, go to www.apple.com/education/apple-distinguished-educator. 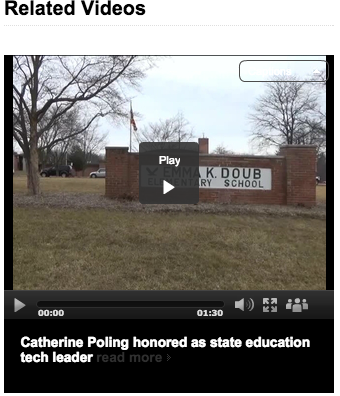 Emma K. Doub Principal Catherine Poling was named Maryland Outstanding Leader Using Technology. Catherine Poling, principal of the Emma K. Doub School for Integrated Arts & Technology in Hagerstown, said Monday that she was surprised and humbled after learning that she had been named Maryland Outstanding Leader Using Technology 2015. "It's recognition of all of our works," said Poling, referring to the staff at Doub. Poling is in her second year of a two-year term as president of the Maryland Society for Educational Technology, or MSET, which gave her the award. She was nominated for the award by Conococheague Elementary School Principal Nicole Paylor. Poling was not involved in the award process this year, she and Paylor said. Paylor said MSET's executive board members lead by example, calling Poling "an inspiration to all of us." "I really feel like I have grown as a leader just by being friends and colleagues with her," she said. The activities, instruction and integration of technology at Doub "blows me away," Paylor said. As of last school year, each student in grade one through five at Doub has been assigned an iPad tablet computer, Poling has said. 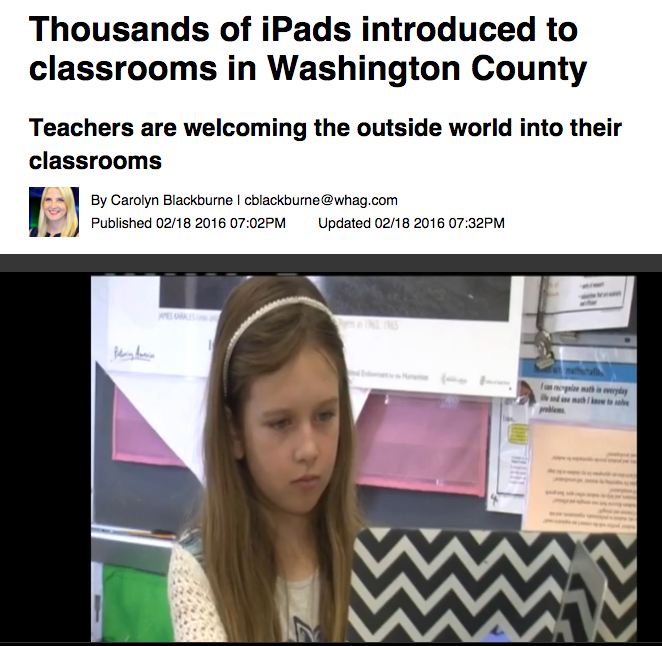 Not every student has access to a computer at home, so for this school year students in a few classes get to take their assigned iPads home to continue their schoolwork, she said. Technology "engages kids. It excites kids.... 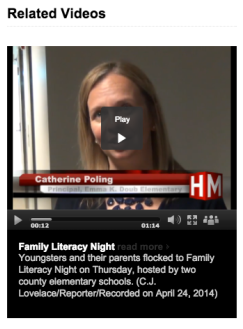 It's a great way for both teachers and students to learn," Poling said Monday. Poling said technology can enhance learning opportunities for students, providing them access to resources they might not have otherwise. She also noted how teachers can personalize learning with technology. Poling became principal at Doub, in the city's South End, in July 2011 after working for Frederick County (Md.) Public Schools since 1996, according to Poling and a Washington County Public Schools news release. Doub won a 2013-2015 Apple Distinguished School Award in 2013 for innovation, leadership and educational excellence This is the third consecutive year an educator from Washington County Public Schools has been honored by MSET. Schools Superintendent Clayton Wilcox received the same honor as Poling last year, and went on to be named an outstanding leader by the International Society for Technology in Education. Western Heights Middle School teacher Shawna Sunday was named Maryland's outstanding educator using technology in 2014. And Christine Hurley received that honor in 2013 when she was Doub's library media specialist. Poling has co-led the county school system's Digital Learning Leadership Group and the Digital Learning Advisory Committee since June 2014. Julie E. Greene is a reporter for The Herald-Mail. She can be reached via email at julieg@herald-mail.com.